The present CD showcases six of the 'Twelve Concertos in Seven Parts' arranged by Charles Avison from harpsichord sonatas by Domenico Scarlatti (1685-1757). These were ‘devised’ in 1744. Avison made use of Scarlatti’s keyboard music found in two books of exercises, Essercizi per Gravicembalo edited by Thomas Roseingrave and solo pieces that were still in manuscript. Of the dozen examples of these Concertos, six are presented on this disc. Based on their exceptional performance, I hope that Concerto Köln are planning to record the final six (1, 2, 7, 8, 10, 12) in the near future. Charles Avison was born in Newcastle-on-Tyne in 1709. He studied in London with Lucca-born violinist and composer Francesco Geminiani (1687-1762) who was himself a one-time pupil of Scarlatti and Corelli. Five years later, he collaborated in a collected edition of the psalms of Benedetto Marcello (1686-1739). From 1736, he was organist at St. Nicolas Church (later the Cathedral) in Newcastle. Avison died in his home city on 9 or 10 May 1770. He is also remembered for his musicological writings such as Essay on Musical Expression (1752). His compositions include something in the order of fifty concertos for string orchestra and three volumes of sonatas for keyboard and violin. Charles Avison is well represented on CD with some 21 recordings (January 2016) currently featuring his work. 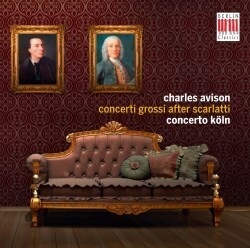 Stylistically, Avison’s music ‘compares favourably with that of Thomas Arne, William Boyce and John Stanley’. Briefly, a ‘concerto grosso’ (grand or big concerto) was a work popular in the 17th and 18th centuries (modern examples exist: Vaughan Williams, Hoddinott and Alwyn). The band is divided into two parts: a group of solo instruments, the concertino, which usually take an important role and the main orchestra (tutti or ripieno). I suggest listening to the Presto in D major, which is the last ‘bonus’ track on the CD. This is Scarlatti’s Harpsichord Sonata in D minor (K29). It has been included to allow the listener to see one example of how Avison made use of his material. Compare it with the second movement ‘Con furia’ of the Concerto VI. Here the ‘virtuosic passage work’ played by the soloist, is often shortened by Avison and is played by the string concertino. The ‘dance parts’ are mostly transcribed directly and the basic themes are presented as ‘purely’ as possible. The result is neither arrangement nor reworking: it is more ‘music by Avison and Scarlatti simultaneously’. I would then take the Concerti Grossi one at a time. The music is splendidly played by the Concerto Köln. This ensemble was founded in 1985 and is dedicated to seeking out unfamiliar music as well as performing the established repertoire. They do not have a conductor as such, but an Artistic Director and various concert masters. Recent recordings include Anton Eberl’s Symphonies (Teldec), Handel’s Israel in Egypt and the Symphonies of Henri-Joseph Rigel. The liner-notes are most helpful. After a brief introduction, there is a paragraph on the composer, a discussion of the music and, most interestingly, information about the interpretation of this music. Concerto Köln made extensive study of Avison’s treatise Essay on Musical Expression and compared this with other contemporary sources before making the recordings. Amusingly, the liner-notes suggest that Newcastle-upon-Tyne is at the ‘north eastern corner of Great Britain’ which seems to be geographically misplaced. I was a little concerned that no timings are given for these works, nor an overall duration of the CD. The track-listings include details of the sources of Domenico Scarlatti’s harpsichord by Ralph Kirkpatrick numbers (K) and Alessandro Longo numbers (L) numbers. Other references include ‘VN’ which indicates a manuscript located in Venice and ‘RG’ numbers pertaining to Thomas Roseingrave’s edition of the sonatas. These abbreviations are not explained in the liner-notes. This present recording aims to help the English master composer Charles Avison 'reach a broader audience and become a name once again – as the sharp-tongued author, brilliant observer, ingenious composer and savvy arranger that he was.' It is an objective well-achieved.